Before taking the short drive to Capogna Flowers, we invite you to browse our website, to learn more about who we are and what we do. You can also view our photo gallery to see a sneak peak of our retail operation. Be sure to check back regularly since we are continuously updating the site with new featured products as well as weekly specials. The Colours – In geraniums alone we have 25 different colours available to satisfy your needs. 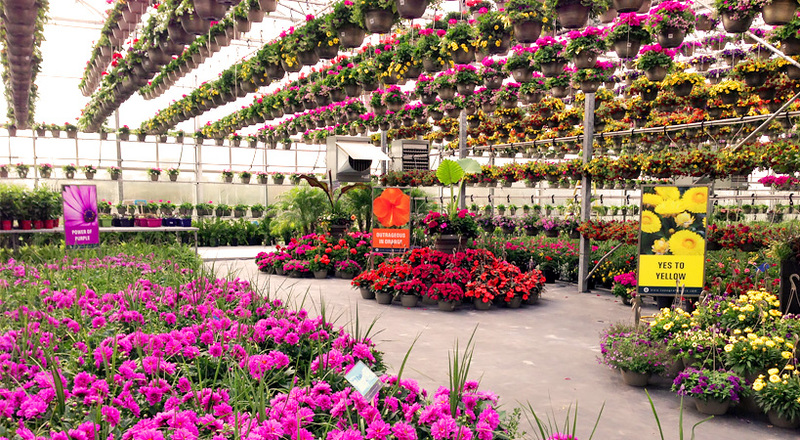 The Quantities – There are over 5000 hanging baskets for you to choose from and don’t forget that’s just in our garden center! There’s plenty more in the back. The Varieties – Shop through our annuals and perennials, don’t be surprised if it is the biggest selection you will find. The Reasonable Prices – One might ask how the variety and patio pot mixtures can be so different, yet so reasonable. Well it’s simple; Flowers are from us, The Grower. The Team – Have our helpful staff give you suggestions for your outdoor space or bring in your own ideas and we can help!